In 1991, SEGA introduced the video game world to a speedy, borderline rambunctious hedgehog named Sonic. A blue-haired, spike-headed character capable of super speed has been the foil of the malevolent figure Doctor Ivo ‘Eggman’ Robotnik. 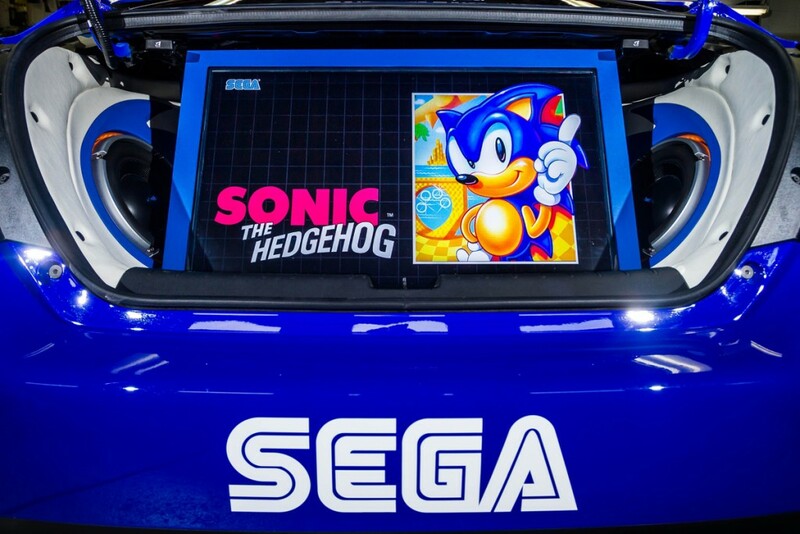 The 25th anniversary for Sonic the Hedgehog was celebrated at San Diego’s Comic-Con at a sold out event taking place at the House of Blues with one special gift. A one-of-a-kind tribute to the video game franchise lead character derived from a 2016 Honda Civic Touring Sedan, the Sonic Civic displays interior and exterior color vibrance reminiscent to the sceneries connected to the SEGA title. Special BASF R-M Sonic Blue and Sonic Yellow paint is accompanied by a vinyl vehicle wrap. 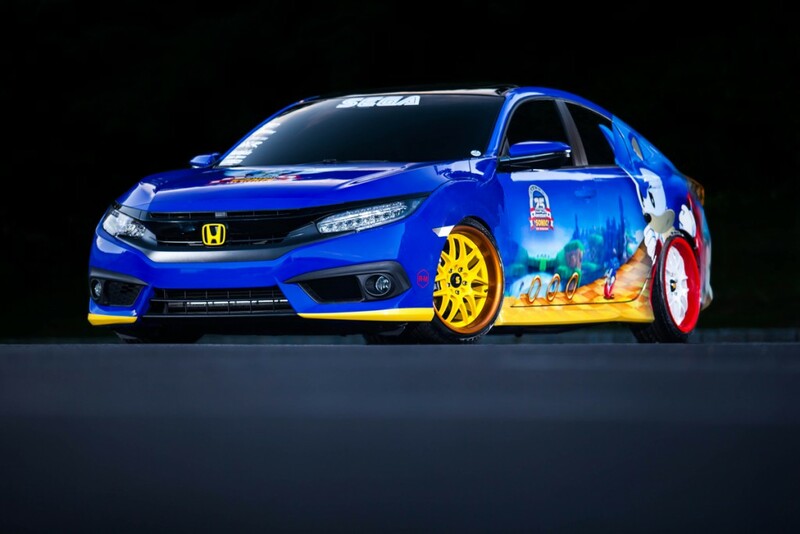 Details such as the front Honda logo and wheels stand out thanks to bold color use. Front wheels of the Honda Sonic Civic are yellow bordered with a gold ring similar to the ones appearing throughout the video game series. 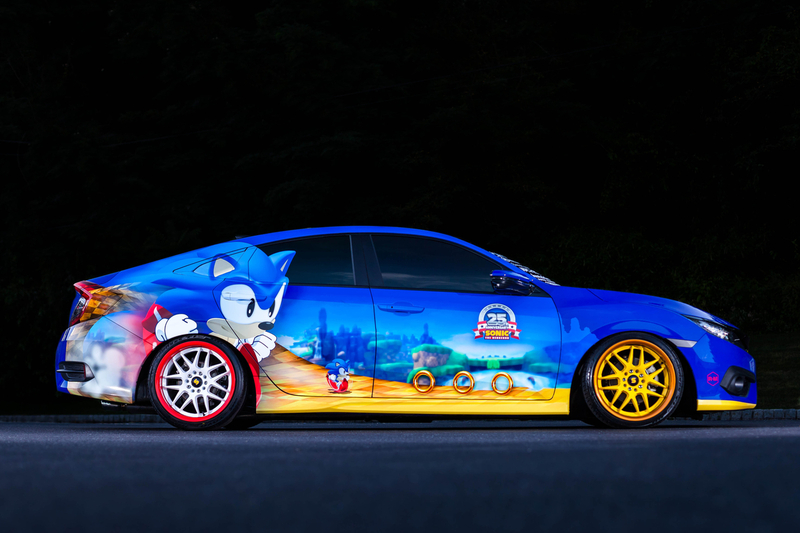 The rear wheels are white outlined by red to reflect Sonic the Hedgehog’s famous sneakers. 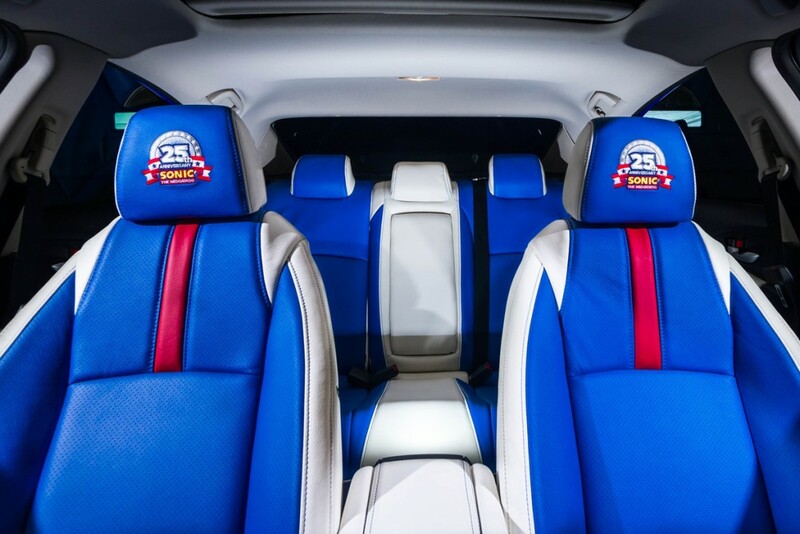 The interior of the Honda Sonic Civic marries Katzkin leather seating featuring blue and white coloring with a touch of red in the center portion of the front seats. The front headrests wear 25th anniversary “Sonic the Hedgehog” logos identical to the markings found on the forward doors and hood. A Rockford Forgate audio-visual system is installed inside the trunk of the Sonic Civic highlighted with a flip-up 32-inch television. After all the custom exterior and interior touches, there were no modifications to the powertrain of the Honda Sonic Civic. A turbocharged 1.5-liter engine generating 174 horsepower propels the sedan with level-clearing performance. At the same time as Sega Genesis gaming consoles heated up with the adventures of first Sonic the Hedgehog experience, the Honda Civic was making a transition to a fifth generation platform. Debuting as a 1992 model year vehicle, the fifth generation Civic also gained notoriety among younger audiences. VTEC engines and the arrival of an all-new two-door coupe body style gave the 1992 to 1995 Honda Civic a reputation that only grew as tuner culture hit the mainstream through the late 1990s. Entering its tenth generation this year, the newest Honda Civic is very much like a beloved classic video game that received a reboot met with great acclaim. Like Hondas? Check out some cool custom ones HERE.